Implementing a risk management process is vital for any organization. Good risk management doesn’t have to be resource intensive or difficult for organizations to undertake or insurance brokers to provide to their clients. With a little formalization, structure, and a strong understanding of the organization, the risk management process can be rewarding. Risk management does require some investment of time and money but it does not need to be substantial to be effective. In fact, it will be more likely to be employed and maintained if it is implemented gradually over time. The key is to have a basic understanding of the process and to move towards its implementation. The four main risk categories of risk are hazard risks, such as fires or injuries; operational risks, including turnover and supplier failure; financial risks, such as economic recession; and strategic risks, which include new competitors and brand reputation. Being able to identify what types of risk you have is vital to the risk management process. An organization can identify their risks through experience and internal history, consulting with industry professionals, and external research. They may also try interviews or group brainstorming, as discussed in this Project Manager article 8 New Ways to Identify Risks. It’s important to remember that the risk environment is always changing, so this step should be revisited regularly. What is the likelihood of a risk occurring and if it did, what would be the impact? Many organizations use a heat map to measure their risks on this scale. A risk map is a visual tool that details which risks are frequent and which are severe (and thus require the most resources). This will help you identify which are very unlikely or would have low impact, and which are very likely and would have a significant impact. Knowing the frequency and severity of your risks will show you where to spend your time and money, and allow your team to prioritize their resources. More details on risk maps can be found in our blog posts on the topic: The Importance of Risk Mapping and How to Build a Risk Map. What are the potential ways to treat the risk and of these, which strikes the best balance between being affordable and effective? Organizations usually have the options to accept, avoid, control, or transfer a risk. Accepting the risk means deciding that some risks are inherent in doing business and that the benefits of an activity outweigh the potential risks. To avoid a risk, the organization simply has to not participate in that activity. Risk control involves prevention (reducing the likelihood that the risk will occur) or mitigation, which is reducing the impact it will have if it does occur. Risk transfer involves giving responsibility for any negative outcomes to another party, as is the case when an organization purchases insurance. Once all reasonable potential solutions are listed, pick the one that is most likely to achieve desired outcomes. Find the needed resources, such as personnel and funding, and get the necessary buy-in. Senior management will likely have to approve the plan, and team members will have to be informed and trained if necessary. Set up a formal process to implement the solution logically and consistently across the organization, and encourage employees every step of the way. Risk management is a process, not a project that can be “finished” and then forgotten about. The organization, its environment, and its risks are constantly changing, so the process should be consistently revisited. Determine whether the initiatives are effective and whether changes or updates are required. Sometimes, the team may have to start over with a new process if the implemented strategy is not effective. If an organization gradually formalizes its risk management process and develops a risk culture, it will become more resilient and adaptable in the face of change. This will also mean making more informed decisions based on a complete picture of the organization’s operating environment and creating a stronger bottom line over the long-term. 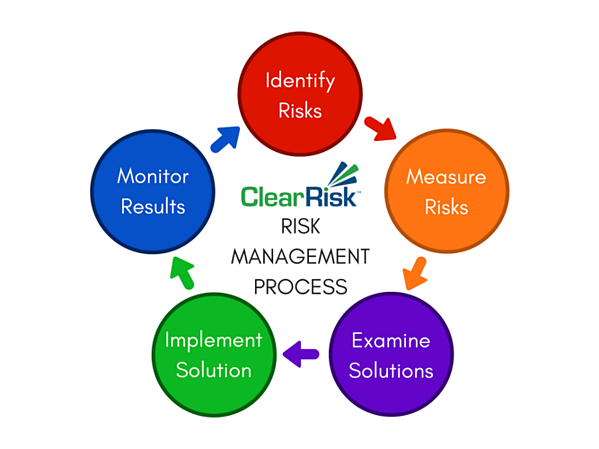 ClearRisk's cloud-based Claims, Incident, and Risk management system allows organizations to better control their risk management activities. We are proud to help our customers introduce new risk management initiatives and lower the cost of risk. Interested? Editor's Note: This post was originally published in 2010 and has been edited for comprehensiveness and accuracy.